Bandeja paisa, (spanish for "Paisa Platter" ), also known as bandeja de arriero, bandeja montañera, or bandeja antioqueña, is a typical fusion cuisine Colombian dish. The main characteristic of this dish is the oversized amount of food and the wide variety of ingredients, which don't allow this dish to be served in a single regular plate, so it must be served in a Platter or a Tray. 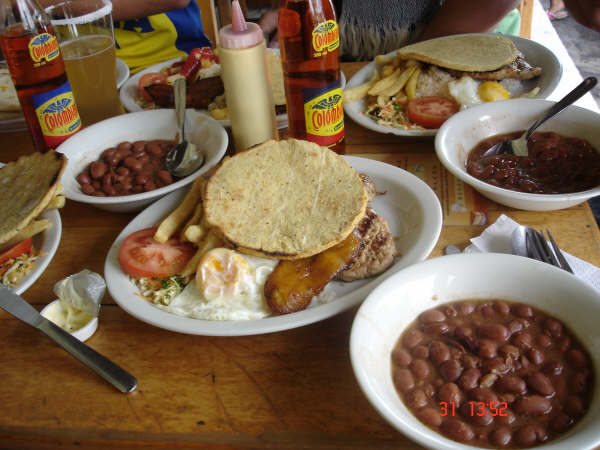 Bandeja Paisa origin was influenced by several different cultures that inhabited Colombia throughout the centuries, including the Indigenous peoples of Colombia, as well as colonial Spaniards and Africans. In the 19th century, there was presence of French and British colonialists who brought their cuisine with them. The current form and presentation of the Paisa Platter is relatively recent. There are no references in the food writing about this dish before 1950. It is probably, an interpretation of the local restaurants of simpler peasant dishes. One of its most prominent features is the juxtaposition of native American and European ingredients, which is also observed in other mestizo dishes of Latin American cuisine, such as Venezuelan Pabellón criollo or Costa Rican Gallo Pinto. The Bandeja Paisa is nutritious, and particularly rich in protein from the beans and meat, but is not particularly heart-healthy due to its large amount of saturated fat (mainly from chorizo and pork rind). It contains about 1500 to 1800 calories, and a large amount of carbohydrates.